The most clear-cut examples are to be found among the blue-green algae (Cyanobacteria), and it was indeed in a blue-green algal species that ontogenetic chromatic adaptation was first described. Gaidukov (1902) observed that Oscillatoria rubescens was red in colour when grown in green light, and blue-green when grown in orange light: he attributed these colour changes to the synthesis of different kinds of pigment. Boresch (1921) showed that the colour changes are due to shifts in the types of biliproteins synthesized by the algae: the red cells contain predominantly phycoerythrin, the blue-green cells mainly phycocyanin. This phenomenon was considered by Engelmann and Gaidukov (1902) to be an example of complementary chromatic adaptation, the pigment induced by a specific waveband being one which absorbs that waveband (phycoer-ythrin and phycocyanin have their absorption peaks in the green (^565 nm) and the red (^620 nm), respectively): 'complementary' because the pigment has the complementary colour to that of the light that induces it. The phycocyanin formed in group I and group II strains has two polypeptide subunits, a and b. Bryant (1981) found that in 24 of the 31 group III strains, the phycocyanin formed in green light also contained just two subunits, but the phycocyanin from cells grown in red light contained four subunits, a1, a2, b1 and b2. The particular subunits present in phycocyanin in the green-light-grown cells were a2 and b1. These, being always present, Bryant referred to as constitutive: the other two, a1 and b2, formed in red light, he referred to as inducible. Thus, in these 24 strains it appeared that the increased phycocyanin formation induced in red light consisted of synthesis of different kinds of phycocyanin subunit. It was not possible to determine from the data whether the new phycocyanin subunits associated to form a distinct phycocyanin species, (a1b2)n, or whether they aggregated with the two constitutive subunits, a2 and b1, to form a hybrid phycocyanin. In the remaining seven group III strains, no a1 and b2 phycocyanin subunits were found in red-light-grown cells: the extra phycocyanin in these cases may have consisted just of additional a2 and b1 subunits. In Tolypothrix tenuis, Ohki et al. (1985) found that chromatic adaptation in green light resulted in a one for one substitution of phycoerythrin for phycocyanin, so that phycobilisome size remained constant. Ohki and Fujita (1992) found that cells of the marine cyanophyte Phormidium sp. C86 were coloured dark green when grown in red light, and purple-red when grown in green light, this change in colour being due to a massive increase in the cellular content of phycoerythrin. The bili-protein composition (molar basis) in red light was 13% phycoerythrin, 64% phycocyanin and 22% allophycocyanin. In green light this changed to 82%, 10% and 8%, respectively. The phycobilisomes in cells grown in green light were twice as large as those in red-light-grown cells. Fig. 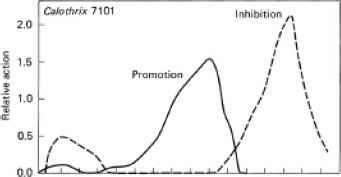 12.7 Action spectra for the promotion and inhibition of phycoerythrin synthesis in the blue-green alga Calothrix 7101 (Tolypothrix tenuis) (after Diakoff and Scheibe, 1973). The reciprocal of the amount of radiant energy (J cm-2) required to produce a 25% increase (promotion) or decrease (inhibition) in the amount of phycoerythrin (as a proportion of total biliprotein) synthesized in the dark after the light treatment is (after normalization to 500 or 680 nm) plotted against wavelength. 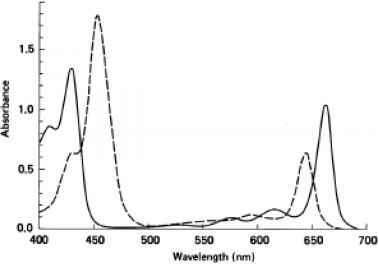 has a subsidiary peak in the UV at about 350 nm.309,422 The shape of these action spectra are consistent with the photoreceptive pigment system being itself biliprotein in nature. Bogorad (1975) has suggested the term 'adaptochrome' for any photoreceptive pigment involved in the regulation of biliprotein synthesis. Scheibe points out that both forms of the pigment could be biologically active, PG promoting phycocyanin and PR promoting phycoerythrin formation, or else just one form could be active, its presence or absence determining which of two possible differentiative pathways is to be followed. Oelmuller et al. (1988) have shown that in Fremyella diplosiphon green light induces the formation of the phycoerythrin messenger RNA and red light induces formation of the phycocyanin mRNA. Although in light-grown cells the spectral quality of the light influences the pattern of synthesis of biliproteins, light is not essential for the synthesis of these pigments to occur: facultatively heterotrophic cyano-bacteria continue to make biliproteins when grown on carbohydrate medium in the dark. When such strains in group III are grown in the dark their biliprotein composition is similar to that of cells grown in red light: high in phycocyanin and low in phycoerythrin.1344 Bryant (1981) found that the phycocyanin synthesized by Calothrix strains 7101 and 7601 in the dark included the inducible subunits, a1 and b2, found in red-light-grown but not green-light-grown cells. This was the case whether the inocula used were derived from cultures grown in red or green light. Bryant concluded that it is not exposure to red light, but the absence of green light that turns on the synthesis of the inducible phycocyanin subunits. If there is indeed a photoreversible pigment involved in the control of biliprotein synthesis, then it is presumably the PG form, which is synthesized by cells growing in the dark.